WHEELS: 18" X 7" GLOSS BLACK 5-SPOKE ALUMINUM, TRANSMISSION: 9-SPEED 948TE AUTOMATIC (STD), TIRES: P225/55R18 AS, QUICK ORDER PACKAGE 24J -inc: Engine: 2.4L I4 MultiAir FlexFuel, Transmission: 9-Speed 948TE Automatic, HYDRO BLUE PEARLCOAT, GVWR: 5,050 LBS (STD), FRONT LICENSE PLATE BRACKET, FLEX FUEL VEHICLE, ENGINE: 2.4L I4 MULTIAIR FLEXFUEL (STD), ENGINE: 2.4L I4 MULTIAIR -inc: 50 State Emissions. 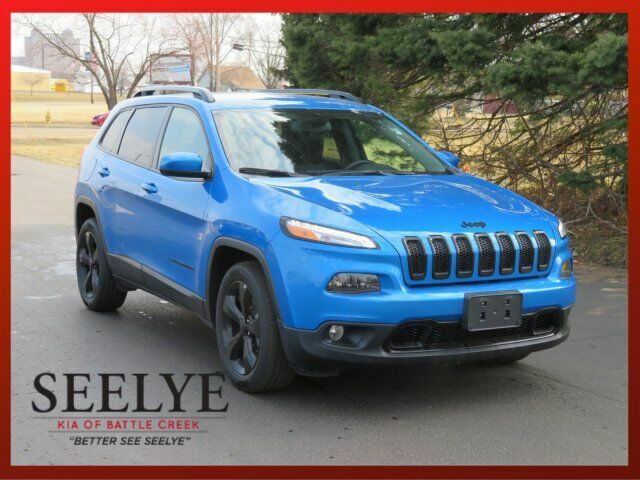 This Jeep Cherokee has a strong Regular Unleaded I-4 2.4 L/144 engine powering this Automatic transmission. ALTITUDE PACKAGE -inc: Gloss Black Exterior Badging, Tires: P225/55R18 AS, Gloss Black Roof Rails, Continental Brand Tires, Gloss Black Fascia Applique, Gloss Black Grille Surrounds, Wheels: 18" x 7" Gloss Black 5-Spoke Aluminum, Black Day Light Opening Moldings , 3.734 AXLE RATIO (STD), Wheels: 17" x 7" Aluminum, Variable Intermittent Wipers, Valet Function, Urethane Gear Shift Knob, Trip Computer, Transmission: 9-Speed 948TE Automatic, Transmission w/Sequential Shift Control and Oil Cooler, Towing Equipment -inc: Trailer Sway Control, Tires: P225/60R17 BSW AS, Tire Specific Low Tire Pressure Warning, Tailgate/Rear Door Lock Included w/Power Door Locks, Systems Monitor, Strut Front Suspension w/Coil Springs, Streaming Audio, Spare Tire Mobility Kit, Single Stainless Steel Exhaust w/Chrome Tailpipe Finisher, Side Impact Beams, Sentry Key Engine Immobilizer.